Renewable energy is truly having its moment in the sun. One doesn’t have to look hard to find solar panels on the neighbors’ roofs, majestic wind turbines popping up across the Great Plains, or that new Tesla you’ve seen rolling around town. Even major Fortune 500 companies are buying clean energy at a record pace to power data centers and factories around the country. The newest arrival to the clean tech party, however, just happens to be one of the best suited to capture the long-term, low-cost benefits of renewable energy: higher education. With higher education increasingly seeking innovative energy solutions, Rocky Mountain Institute’s Business Renewables Center (BRC) is proud to announce a strategic partnership with Second Nature, a Boston-based organization helping higher education institutions lead on climate action. The partnership makes the BRC’s exclusive primers, guides, and market intelligence available to the 600+ higher education institutions that have joined Second Nature’s Climate Leadership Network by signing one of three commitments: the Carbon Commitment, the Climate Commitment, or the Resilience Commitment. Converting energy purchases from traditional fossil fuels to newly affordable renewables can be a daunting step for businesses concerned about shareholder value. But, with over 5 gigawatts (GW) of deals already completed, the successful adoption of clean energy solutions facilitated by the BRC is proving the case for the corporate world and should serve as a bellwether for the higher education sector as well. 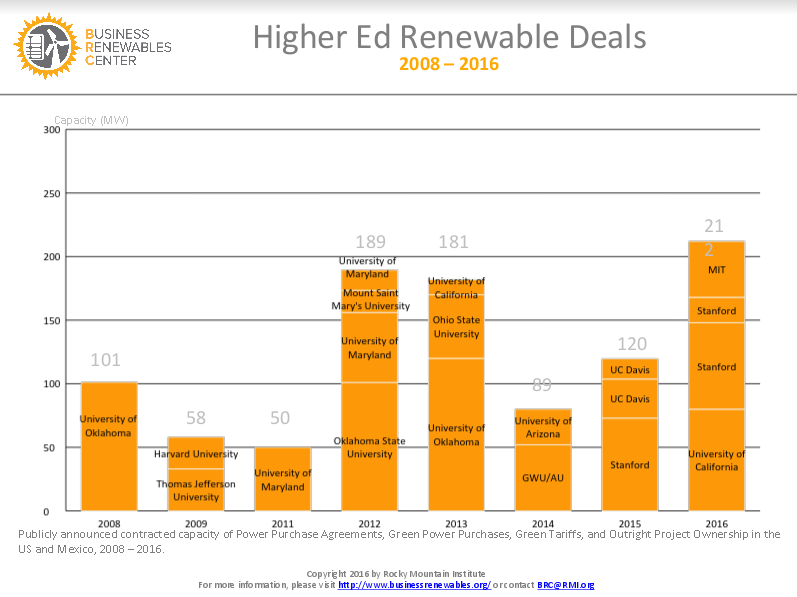 Although the higher education market is less developed than the corporate market, renewable energy procurement by universities recently surpassed 1 GW. The first movers have shown ingenuity when structuring deals to best fit their unique energy needs. For example, as a licensed retail energy provider, Harvard University, one of the first BRC university members, has been required by the Massachusetts renewable portfolio standards (RPS) to source an increasing amount of its electricity from renewables each year. Back in 2009, the university decided to enter into a 15-year power purchase agreement (PPA) for 12 MW of wind power from Maine. The university also purchases renewable energy credits to help meet the RPS, and has earned over 100 LEED certifications for on-campus buildings, the most of any university in the world. Image courtesy of the Rocky Mountain Institute. For another early BRC university member, George Washington University (also a charter Climate Commitment signatory), taking the step to convert more than 50 percent of its energy usage to renewables involved an innovative partnership with American University and the George Washington University Hospital to tap 52 MW of solar photovoltaic power from a Duke Energy project in North Carolina. This concept of aggregation, bringing interested buyers with small loads together to split the offtake from one large project, is currently a hot topic for corporate purchasers. It was also a main theme at the November, 2016 BRC conference at GM’s headquarters and will be a focus of Second Nature’s future efforts. Transitioning to clean energy can appear daunting to newcomers to the energy markets. Traditional power providers oftentimes fail to offer suitable products for smaller institutions, and sometimes on-site projects do not deliver sufficient carbon reductions or meet electricity demand. But once universities join the Climate Leadership Network and the BRC, the collective efforts of this community can begin to tackle market barriers in a systematic and effective manner. By joining the BRC, member universities will gain access to a suite of information and resources. Colleges and universities can now take advantage of the same transactional tools, market intelligence, and network of experts as the Fortune 500 players already engaged with the BRC. This includes data on—and in-depth insights into—the deal-making process, easy access to future renewable energy project opportunities, and a world-class network of market participants to draw from when planning strategies for meeting energy needs in an efficient and economic manner. This past November, representatives from Harvard, the University of California, University of Washington, and University of Michigan attended the BRC conference at GM’s headquarters in Detroit. Likewise, nearly 300 universities from across the country recently joined Second Nature at its 2017 Presidential Climate Leadership Summit in Arizona. While universities and corporates go through different internal processes and may face different roadblocks along the renewable energy journey, they can both benefit from lessons learned and the best practices that are shared by the BRC community. With well-defined goals in place, institutions can turn to the BRC to initiate the process of aggregating demand for smaller schools—a market that holds much potential but is still seeking standardization. With a coordinated marketplace housed in the BRC and the existing reporting platform housed at Second Nature, aggregation deals will become easier to put together. Likewise, large-scale projects can be complex to develop, especially for the colleges and universities lacking in deep experience in the energy markets. The BRC aims to streamline the early stages of a transaction through tools such as the Term Sheet and RFP Templates. Buyers can use these templates to learn about market norms or even as starting points for their project negotiations. While existing BRC tools can help universities tackle a renewable energy project, as the BRC university community grows, the increasing depth of information and experiences that are shared will accelerate the growth of this sector. There’s never been a better time for schools to go renewable. Look at the data: the cost barrier to implementing clean energy solutions has come down dramatically in recent years. Since 2008, the cost of wind power is down over 40 percent and the cost of utility-scale solar power is down over 60 percent. The result of these advancements on project economics has boosted renewable energy to 68 percent of all new electrical generation capacity in the U.S—the second straight year that clean power eclipsed fossil fuels. Furthermore, the Yale Project on Climate Change Communication finds that 63 percent of all Americans, regardless of political affiliation, believe that global warming is happening, and 77 percent of all Americans want the government to fund research into renewable energy sources. Gallup confirms this sentiment, finding that 64 percent of all Americans are worried a “great deal” or “fair amount” about global warming—an eight-year high. And while universities have a significant responsibility to respond to their students’ social concerns, the economics of renewable energy show that sustainability doesn’t have to be a zero-sum decision for academia. Climate Leadership Network institutions are encouraged to join the BRC today and get started on bringing clean, renewable energy to university and college campuses nationwide. If you are already a part of the Climate Leadership Network, please contact Michele Madia, Director of Education and Partnerships at Second Nature, to take advantage of this opportunity. If you have questions about joining the Climate Leadership Network, please contact commitments@secondnature.org.